Uplift your Access Control System to support Strong Authentication via SMS, Email or TOTP! Access to your enterprise-applications needs to be secure. Event with excellent password policies there is nothing that withholds users from using their own chosen passwords for other purposes like social media. When such third party gets hacked, attackers could use these passwords to enter enterprise-applications. That’s why these days most Access Control services, like ADFS, support the integration of a Multi-Factor authentication adapter. 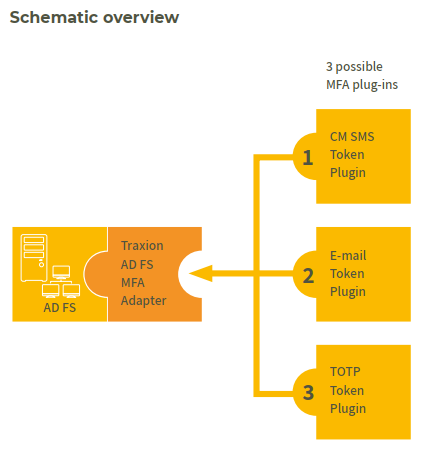 Because the need in the market to find a secure and price-efficient MFA solution, Traxion developed its own AD FS MFA Adapter which you can integrate in AD FS to enforce MFA. Active Directory Federation Services (AD FS) provides single-sign on technologies to authenticate users to multiple applications over the lifespan of a web session. The AD FS MFA Adapter comes with an easy install tool and is designed to support multiple MFA solutions. In the package, we provide 3 possible MFA plug-ins so you can decide yourself which authentication method best fits for your organization. Next to that, additional MFA plug-ins can be developed and customized on your needs!